Joe Steffy's number 61 is being retired at Michie Stadium tomorrow and Army is planning a number of events and giveaways for fans who attend the game. By all accounts there isn't a more deserving football player in America to be immortalized in this way and the halftime ceremony will represent only the third jersey number retired at West Point. It's a big honor for a true Army legend, any guesses to what might be going through Steffy's mind during the ceremony? "I grew up wanting to go to Tennessee," said Steffy. "But I never thought they'd have me. They recruited me pretty aggressively, though. And I loved my time there. I still watch them every chance I get. I'll make every effort to see them Saturday against Florida. Army plays at noon. UT's not on until almost 4, so I should be able to watch most of it." There's something to be said for loyalty, as Joe Steffy is a Tennessee guy through and through. His sporting accolades before he came to Army include UT football where he helped the Volunteers to the 1945 Rose Bowl and UT track where he posted a legendary performance in the SEC Track and Field Championship. Football & Track -- Freshman year at Tennessee: Joe was an excellent track man throwing discus, javelin and shot put. He was sent to SEC track championship meet in May, 1945 as Tennessee's one-man track team competing against other SEC teams most of which had 15 to 35 members. Tennessee (read Joe Steffy) came in third for the whole SEC! From Tennessee to Army and beyond, Joe Steffy held himself as a class athlete and a class individual. 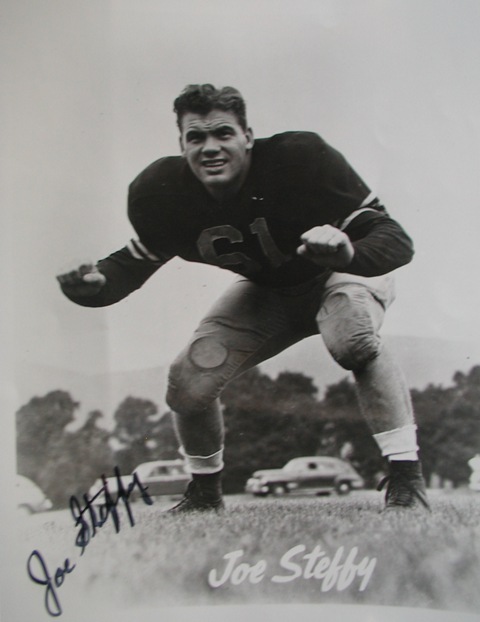 There aren't many college football athletes with the resume of Steffy and if you have a chance to go to tomorrow's game, by all means attend to honor Army's legendary lineman: Joe Steffy. Sal Interdonato has a great article up about Joe Steffy. Definitely a must-read.